Besides our experienced employees, of which some have been a part of our company for decades and have gone through thick and thin with us, we also have great young talents amongst our staff. 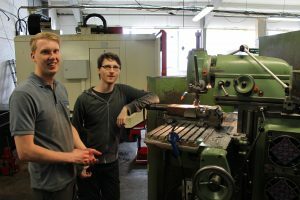 We are proud of our two apprentices Leander Neumann and Felix Flenker. With the work they perform on our machines almost on a daily basis, they provide a valuable contribution to the company as a whole. 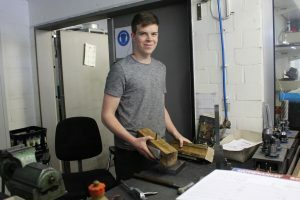 We are particularly pleased with the Felix Flenker’s score in the interim test, where he reached a remarkable 94% in the theoretical part and 97% in the practical part. Hats off! Regardless of their professional success, we appreciate their personal demeanour and are glad that they are a part of our team. 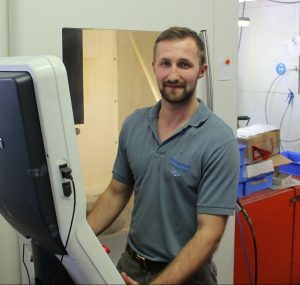 Daniel Kuschick has been with us for several years and is doing great work on our milling machines. As a trained industrial mechanic for the construction of precision mechanics, he can draw from a broad expertise. Since he already completed his apprenticeship with us, he knows the company like the back of his hand. In fact, the tradition between the Rittmeyer company and the Kuschick family goes back even further. His uncle Rainer Kuschick has been part of our team as workshop supervisor since 1986 (31 years) and was originally hired by the company founder Bernward Rittmeyer. Alexander Grenz is also a homegrown talent. After his apprenticeship as an industrial mechanic for the construction of precision mechanics under our roof, he decided to stay right here. He is now primarily responsible for the milling machines. What does he enjoy in particular? Small precision parts are his passion. A natural choice for an industrial (precision) mechanic. We would like to thank Alex for his efforts over seven years and wish us many more. That is why we are proud of our young talents.